The Cathedral of Seville is ranked as the largest Gothic Cathedral in the world. Granted World Heritage status by UNESCO in 1987, its appearance is product of successive enlargements and transformations since the original mosque was built by the Almohads in the XII century and then mostly demolished in the 15th to make way for the gothic Cathedral. Parts from the original mosque still remain to this day - the courtyard, known as the Patio de los Naranjos, which houses important files and documents kept in the Colombian library; and the minaret (Giralda). From here - after a long climb up ramps - there is one of the most stunning views over the city. This tower is one of the few remains of the former Almohad mosque - transformed in the 15th century by the addition of a section to house bells topped by a lantern. The 16th century weather vane that crowns the tower, popularly known as "the Giraldillo", symbolises the victory of the Christian faith. The Renaissance figure represents a woman with a shield in one hand, and a palm leaf in the other. 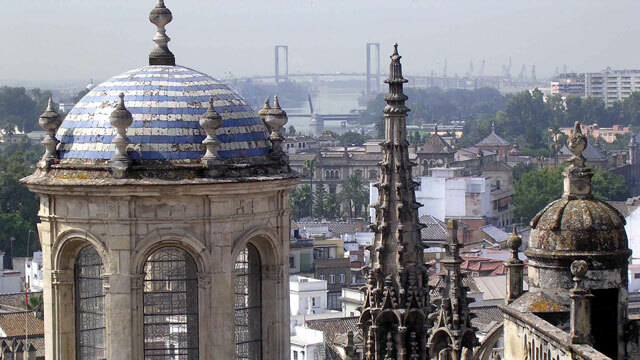 The "giralda" as it was first known - from the spanish girar or to spin - eventually gave its name to the whole tower. Christian additions took the original 51 metre tower to a total height of 103 metres. The Royal Alcázar Palace is considered to be the finest example of mudéjar architecture in all of Spain - that is, in Islamic style but under Christian rule. Kings Alfonso X and Pedro I, known as the Cruel, employed craftsmen from Granada and Toledo to work on the Palace, resulting in beautiful wood carving, elaborate tile and plasterwork. This part of the Palace is reminiscent of the Alhambra, with courtyards and fountains and wonderful geometric decoration. The Alcázar had previously been a Fortress and Palace under Moorish rule and elements still remain - for example, the Patio del Yeso and some of the exterior walls. Later Kings and Queens greatly extended and remodelled the Palace and gardens, but it still remains fundamentally mudéjar. The extensive gardens stretch out over just under 15 acres. This, like the Palace has seen development through the centuries and there are three distinct areas. Moorish, Renaissance and Modern. The gardens are a green oasis in the very heart of Sevillle and like the Palace, a delight to wander through. Dating from the first third of the 13th century, the Torre del Oro formed part of the city's defences as a watch tower. It was once joined by an arch to the part of the city walls which joined the Alcázar to the river. Legend has it that Pedro I, the Cruel, visited his mistresses here, and since then it has served both as a chapel and prison. Since 1944 the tower has been home to the Naval Museum. It contains models, navigational instruments, charts and documents of historic interest. There are two different theories as to the origins of its name - one, deriving from its arabic name bury al-dahab, that it was once covered with golden tiles - though there is no evidence of this; and the other, apocryphal theory, that it served as a store for all the wealth and gold returning from the Americas (this was in fact stored in the Casa de la Contratación). Crescent shaped and encompassing an open space with bridges, a canal and a central fountain; the Plaza de España lies within the verdant Maria Luisa park. It was built by Aníbal González as the Pavilion representing Spain for the Hispano-American Exhibition of 1929. The building itself has an arcaded walkway and is punctuated by towers at each end. Designed in the Regionalist style (a mixture of mudéjar, gothic and renaissance styles), it is built of brick and is decorated with ceramics. Around the square are 48 benches representing the Spanish provinces - in alphabetical order - and each is decorated with ceramic tiles, the coat of arms and map of the province. The four bridges crossing the canal represent the 4 kingdoms which constitute the Spanish crown: Castille, Leon, Navarre and Aragon. This building is currently occupied by various public institutions and has featured as a location in films including Lawrence of Arabia and more recently, Star Wars Episode II: Attack of the Clones. Dating from 1761, this is one of the oldest bullrings in Spain and one of the most famous. It is owned and maintained by the Real Maestranza de Caballería de Sevilla - after which it is named - a Royal Company made up of noblemen from ancient families of Seville dating from 1248. As well as promoting Bullfighting and horsemanship, the Company sponsors many charitable and artistic activities in the city. The original Maestranza bullring was the first in Spain. It was built near the present-day one in 1730, though was rectangular in shape and wooden in construction. Present-day Maestranza bullring and its adjacent buildings occupy a triangular block, with the principal gateway to the bullring facing the river. The buildings include: a small chapel for the bullfighters; a Museum - including historic costumes and works of art; and the seat of the Company of the Real Meastranza. The bullfighting season begins on Easter Sunday and finishes in September. In 1785 Carlos III ordered that all documentation relating to the New World and Spanish colonies, then housed in several different places, should be gathered together to form a single archive - the Archivo General de las Indias. The Archive hsa been housed since then in the Casa Lonja de Mercaderes de Sevilla, previously the Merchant's Exchange. This finely balanced renaissance building houses one of the most incredible collections of historical documents in the World. More than 9 kilometers of shelving contain thousands of documents, maps and drawings. Included are Columbus's diary and original documents written by Vasco Núñez de Balboa, Hernán Cortés and Francisco Pizarro. All of the collection is available to researchers. The Archive also holds temporary exhibitions. In 1987 the Archive, both building and contents was made a UNSECO World Heritage Site. Considered one of the finest palaces in Seville, Casa Pilatos dates from the end of the 15th century. Due to close ties with Italy during the course of the16th century, it became a herald of renaissance architectural ideas in the city. The building is a perfect blend of mudéjar, gothic and renaissance styles, built around gardens and patios. It also has an impressive collection of art work including Roman antiques, and paintings and furniture from various periods. Note that ticket prices and opening times are subject to change. Please contact monuments directly or see the official websites for the most up to date information.